Coloured tissue paper adds that nice bit of elegance to your gifts when you use a paper bag. Instead of letting the item inside just roll around inside, the tissues don’t just add a beautiful, festive touch, they also add some much needed padding, keeping your gift secure. Ever found yourself hesitating over those slivers of coloured paper or tissues you’ve got left after you just finished a project? You’re thinking you probably won’t get to use them anymore but you just can’t seem to throw them away for good either. So you collect it all, stuff it into one of your drawers, convenience that one day, you’ll find a use for them. Well, from Best Design Options, one way to use scraps of coloured tissue paper is to fix them together as wrapping paper. Now, you won’t have to toss aside the leftover pieces you’ve hoarded for years. 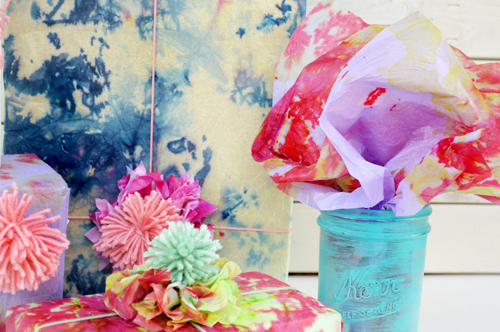 Give them a new lease on life by turning them into wonderful wrapping papers. Another plus? With the creative and ingenious wrapping, your gift is sure to stand out against all the other boringly-wrapped presents lying around. Another idea, this one from BuzzFeed and One Little Project, is to create tissue paper pom-pons out of it. It’s quick and easy to do, once you get the hang of it. Plus, the colours and textures really work to add that pop to a room. From aqua and forest green to lilac, hot pink and scarlet red—along with all the greens and blues in between—these colourful pom-pons bring the fun vibe to anywhere. If you’re planning a party, these will be a hit. First, buy your coloured tissues. You’ll want to go with as many colours as you can get. Carrier Bags for Sale offers an extensive queue of coloured tissue paper in different shades. It’s got a lot of the shades you want—plus the ones you don’t normally see in stores—lime green, sunflower yellow, aqua blue and violet, among others. Make it a balanced palette. Pick your colours carefully. You’d want to go with shades that stand out along with ones that do really well when they’re put alongside other colours. But you also want to mix a few neutrals in there. You never know what kind of project you’ll come up next. You might even be able to surprise yourself. So keep those greys and ivory shades in reserve. Now that you’ve got your tissues, get 10 sheets and lay these on any flat surface. Fold the end to about 2 or 2.5cm. Then flip it over. Then fold it again. And flip…do that until the entire roll has been folded, accordion style. Worried that the folds aren’t strictly the same size? Don’t be. The material is flexible so you’ll have some room to adjust these in a while. Next, fold that in half. Find a wire. A thin jewellery wire works great in this case. Wrap that around the middle. And secure it with a knot. It’s important to remember that you should do all this without letting go of the bent tissue in half. Once you’ve got that wire in place, you can let the folded paper go. But only to reach for a pair of scissors. Then start rounding up the edges of the roll. Go for shallow cuts since that will make the petals come out more. After that, you’ve got something that looks like a paper ribbon. Now, pick an edge and pull one piece of tissue paper from the rest. Don’t break it. Pull it gently until you can see the layers being pulled apart. Once you’re done on one side, do the same on the other. Fluff it all up until you get a good, round shape. Ta-daa! You’ve got a tissue paper pom-pon in your hand! If you plan on hanging these from the ceiling, all you need is a little fishing line and some good adhesive or tape and you’re good to go. For more contrast, try to make dark and light coloured balls. So if you’ve got pink, mix it up with a little violet or hot pink, if you’ve got those shades available. Aside from these, you could also make tissue paper flower toppers for paper bags, garlands and tissue paper tassels to add fun and cheer to any room. Or go big with giant tissue flowers, flower wreaths and cute, tiny pom-pons perfect for treat boxes. So start folding those papers up and discover the many ways coloured tissue papers can be useful and fun.